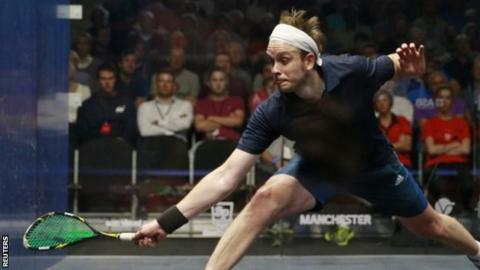 England's James Willstrop stunned world number one Mohamed Elshorbagy to reach the World Championships last eight. Willstrop, 32, has slipped to world number 24 after suffering a career-threatening hip injury. But he took 64 minutes to beat Egypt's Elshorbagy 11-4 11-7 10-12 11-7 in Seattle to reach the quarter-finals. "In the context of everything that has gone on over the past 18 months this is one of my best ever performances," said Willstrop. Willstrop joins fellow countryman and the man he lost to in last year's Commonwealth Games final, second seed Nick Matthew, in the last eight. "I feel great for the moment but I can't get too carried away - it's not the end," he said. In the quarter-finals, Yorkshireman Willstrop faces Colombian Miguel Angel Rodriguez, who has become the first South American to reach this stage (Saturday, 02:00 GMT). Matthew beat Mohamed Elshorbagy's brother, Marwan Elshorbagy, 13-11 12-10 11-5. He now plays Egypt's Tarek Momen (Saturday, 04:00 GMT).